Club o fficers ensure that each club member feels his or her Toastmasters experience is worthwhile. By applying leadership techniques, a club officer creates an atmosphere that supports members in their personal and professional growth. They play a key role in helping members complete Toastmasters’ educational award in the communication and leadership tracks. 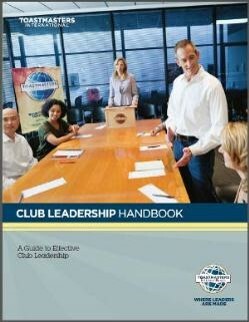 The Club Leadership Handbook is one of the most effective tools club officers can have at their disposal. One vital piece of information included is a description of each of the club officer roles. The Distinguished Club Program and Club Success Plan helps clubs promote quality, ensure productive meetings, provide structure and guidance and increase the enthusiasm of the club. Every year, high-performing clubs are recognized, and may proudly display a Distinguished, Select Distinguished or President’s Distinguished ribbon on their club banner. Click here to view the Distinguished Club Program and Club Success Plan guide. Want to see how your club is doing? Check out the Distinguished Club Programme dashboard and find your club. Promoting our clubs and letting people know how much they can gain from being part of Toastmasters is key. Find out more at https://www.toastmasters.org/Leadership-Central/Public-Relations. This includes the pdf Let the world know: publicity and promotion handbook. Click here for guidance on how you can spend club finances.